This seven-day tour highlights Andalusia’s Moorish heritage and visits the Andalusian cities of Cordoba, Seville and Granada, plus the cathedral city of Toledo. You’ll spend two days exploring Madrid at your own pace, then travel to Andalusia and Toledo to discover the history and culture of southern Spain. 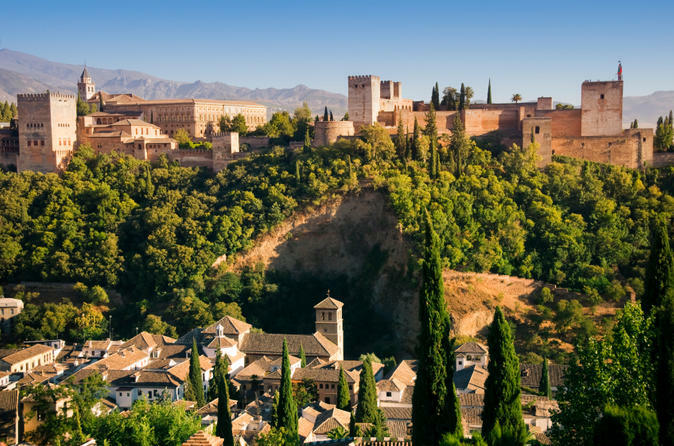 Granada’s Alhambra and Generalife Gardens are just some of the many UNESCO World Heritage Sites you’ll visit in this legendary region of Spain. Choose from three-star or four-star hotel accommodation for all six nights. Your seven-day Spain tour starts with two nights in Madrid, where you’ll have free time and see its top sights on a panoramic tour. Then travel through legendary Don Quixote countryside to take in Cordoba’s multicultural mix of Jewish and Arab backgrounds and medieval architecture. Your last stop for the day is Seville on the Guadalquivir River, home to the eponymous cathedral, Maria Luisa Gardens and colorful Santa Cruz quarter. Spend two nights in Seville, then continue to Granada, renowned for the amazing Arab architecture of the Alhambra, the last stronghold of the Moorish kingdoms and one of Andalucia's special highlights. Following a night in Granada, your last stop is Toledo for a tour of the city’s World Heritage-listed Old Town before returning to Madrid for the night. The next day, your tour concludes with a transfer to the Madrid airport. To customize your trip, you can opt to begin the tour a day later and enjoy your free day in Madrid on Day 7 instead of Day 1. If you are not arriving or departing at the Madrid airport on Day 1 and/or Day 7, you can be picked up and/or dropped off at the central Madrid location of your choice.